Matt Taibbi at Rolling Stone has a farewell to "Manufacturing Consent" co-author Edward Herman - RIP Edward Herman, Who Co-Wrote a Book That's Now More Important Than Ever. 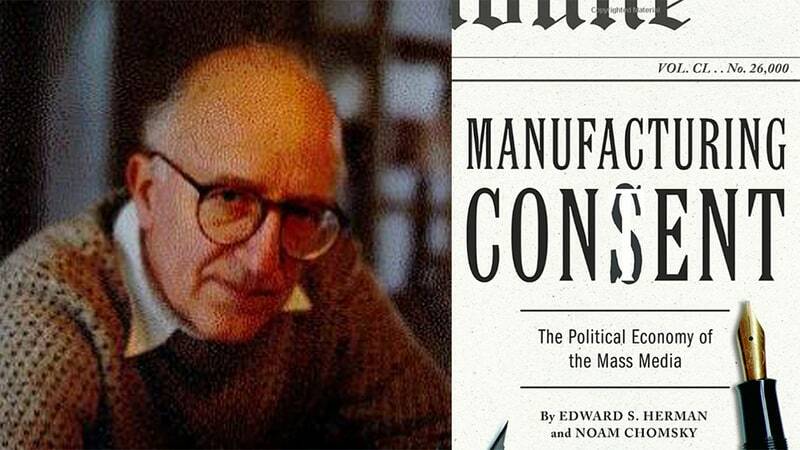 Edward Herman, the co-author (with Noam Chomsky) of Manufacturing Consent, has died. He was 92. His work has never been more relevant. Manufacturing Consent was a kind of bible of media criticism for a generation of dissident thinkers. The book described with great clarity how the system of private commercial media in America cooperates with state power to generate propaganda. "It is much more difficult to see a propaganda system at work where the media are private and formal censorship is absent." The basic thesis of Manufacturing Consent was that propaganda in America is generated through a few key idiosyncrasies of our (mostly private) system. One is that getting the whole population to buy in to a narrative requires the sustained attention of the greater part of the commercial media, for at least a news cycle or two. We don't censor the truth in America, mostly. What we do instead is ignore it. If a lone reporter wants to keep banging a drum about something taboo, like contracting corruption in the military, or atrocities abroad, he or she will a) tend not advance in the business, and b) not be picked up by other media. Therefore the only stories that tended to reach mass audiences were ones in which the basic gist was agreed upon by the editors and news directors of all or most of the major media companies. In virtually all cases this little mini-oligarchy of media overlords kept the news closely in sync with the official pronouncements of the U.S. government. The appearance of dissent was permitted in op-ed pages, where Democrats and Republicans "debated" things. But what readers encountered in these places was a highly ritualized, artificially narrow form of argument kept strictly within a range of acceptable opinions. Herman's last article had a look at the long history of "fake news" published by The New York Times - Fake News on Russia and Other Official Enemies (though they are from from the only ones guilty of this). Mainstream media fake news is especially likely where a party line is quickly formed on a topic, with any deviations therefore immediately dismissed as naïve, unpatriotic, or simply wrong. In a dramatic illustration, for a book chapter entitled “Worthy and Unworthy Victims,” Noam Chomsky and I showed that coverage by Time, Newsweek, CBS News, and the New York Times of the 1984 murder of the priest Jerzy Popieluzko in Communist Poland, a dramatic and politically useful event for the politicized Western mainstream media, exceeded all their coverage of the murders of a hundred religious figures killed in Latin America by U.S. client states in the post-Second World War years taken together. It was cheap and safe to focus heavily on the “worthy” victim, whereas looking closely at the deaths of those hundred would have required an expensive and sometimes dangerous research effort that would have upset the State Department. But it was in effect a form of fake news to so selectively devote coverage (and indignation) to a politically useful victim, while ignoring large numbers whose murder the political establishment sought to downplay or completely suppress.